As an advertiser, there will be occasions in which you will deal with a disapproved ad, delivery problems, or even a banned ad account. When that happens, you’d want a way to contact Facebook. In this article, I show you the ways you can reach Facebook depending on the situation you may find yourself in. The first thing to do when you have a problem with your Facebook Ads is to visit the Ads Help Centre for Facebook Businesses. You can select a topic to find answers to your questions. If you don’t find a solution to your problem, you can look for it in the community forum. This is a great starting point especially if you are starting up with Facebook Ads. More advanced advertisers may need to reach Facebook support for a variety of reasons regarding your account, ad performance, copyright infringements etc. 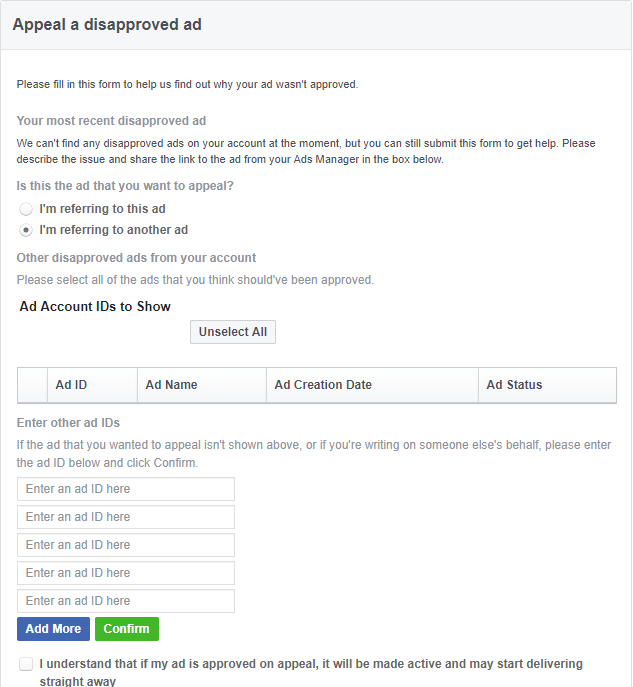 For this reason, I have compiled the majority of the reasons why you will want to reach the Facebook Ads Support team and give you links to the form that you should use depending on the situation you are in. Let’s get started! There are many reasons your ad might get disapproved by Facebook. Mainly it depends on whether the ad is compliant to Facebook’s Community Standards, or it promotes drugs or products that contain prohibited substances or gambling and online lottery. If your ad has been disapproved for reasons other than these, you can submit an appeal. To do so, you need to fill in the appeal form. You ‘ll need to provide them with information about the ad (ad ID, reasons you think it should be approved etc.). If your ad is approved on appeal, it will be become active and may be displayed to your target audience instantly. You can also appeal a disapproved ad from within your Ad account. To do so, click on the details of your ad where you’ll find the ad denial information in a red box. Click the “Appeal” button to open the form. 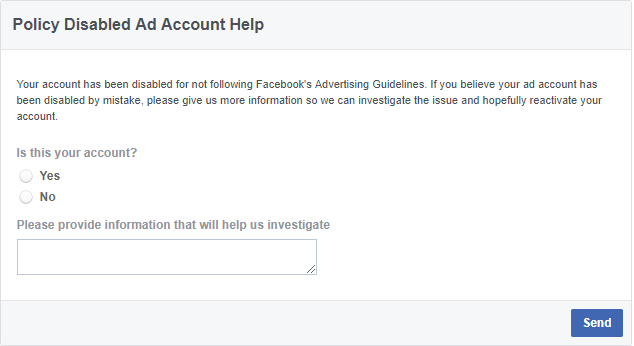 If you were notified that your ad account was flagged for not following Facebook’s ads policies, you can contact Facebook support using this form. If you believe that there is a violation or infringement of Your Rights meaning that someone is using your copyrighted work without your permission, you can fill out this form. A verified Page has a blue tick next to its name. This type of verification is available to selected people, sports, media, entertainment and government Pages. You should have in mind that Facebook doesn’t support verification requests for user profiles and Pages that represent businesses/brands. 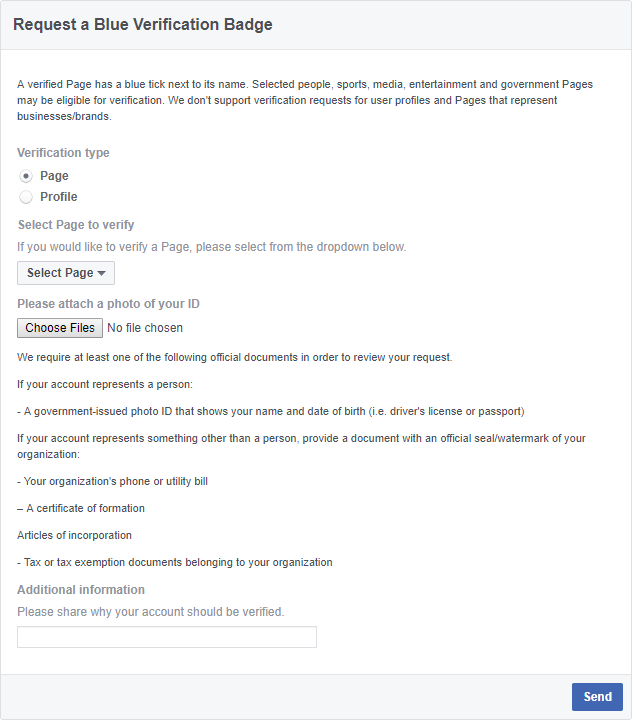 When submitting your verification badge request via the form, you ‘ll need to provide reasons why your Facebook Page should be verified. It will also help if you can include relevant URLs that help illustrate public interest. Once you submit your request, you’ll receive a notification. One last thing to note is that you can submit a new request after 30 days. If you want to boost your live video or any scheduled videos you can do so only if you are verified (at this time). 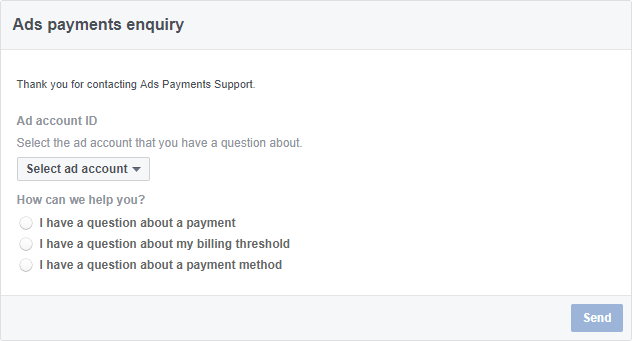 If you are trying to apply a Facebook Coupon to your ad account to no avail, increase your billing threshold or have any problems regarding ads, you can reach the Facebook Support team through this form. You will need to select your ad account and choose the option that best describes your problem. 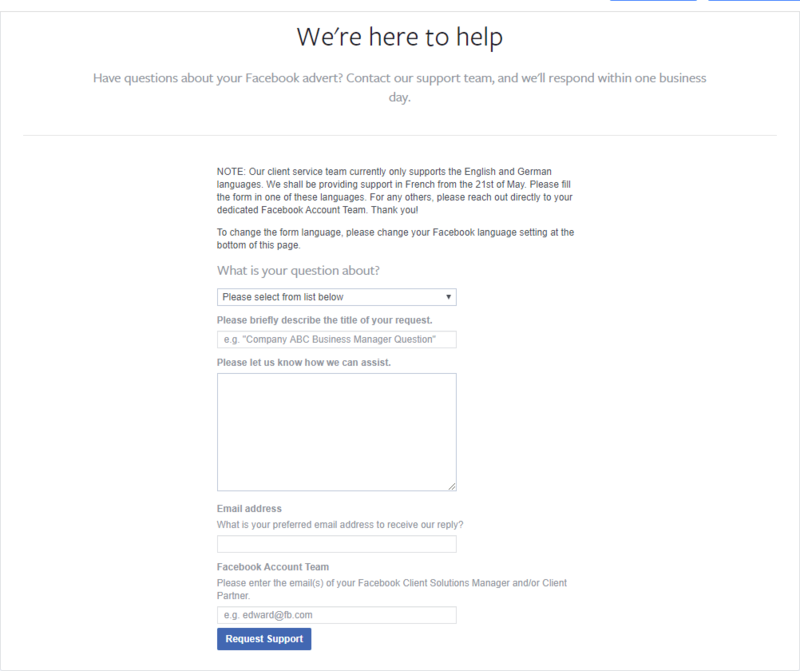 If your issue isn’t listed above or for any other reason, there are two more ways to contact Facebook besides the aforementioned forms: Direct support and email. Direct support is a private support channel that connects businesses such as Facebook Marketing Partners with specific support teams at Facebook. You can access Direct Support through this link https://business.facebook.com/direct-support. Have in mind that you need to append your Business ID at the end of the URL (/?business_id=YOUR_BUSINESS_ID). If you aren’t eligible, you will get the below message. Once you submit a question, you will be notified about any new replies via email or messenger. If the issue you are facing isn’t covered above and you don’t have access to direct support you can use the contact support form to send an email. Once you fill out the form, a member of the support team will reach out to you within one business day. Before contacting the Facebook Ads Support team make sure that your account is in good standing and that you follow Facebook Ads Guidelines to ensure you have high chances of resolving your issue.